The results of the first CIO Decisions Salary and Careers Survey are in -- and there's lots of good news for CIOs. 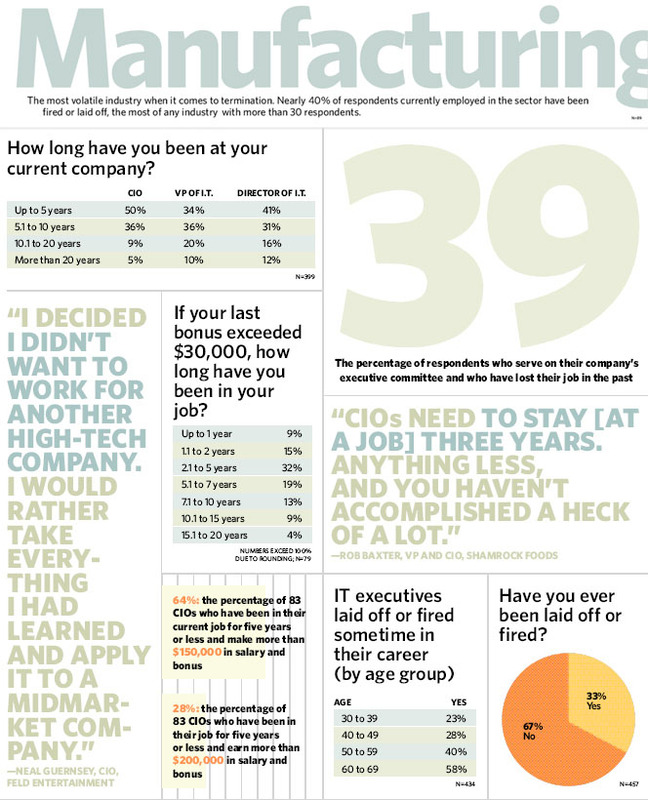 The results are in, and the findings are clear: It's good to be a midmarket CIO these days. Four hundred and fifty-seven IT executives -- including 128 CIOs, 61 vice presidents of IT and 210 directors of IT -- responded to the 2006 CIO Decisions Midmarket Salary and Careers Survey this spring. The results of this first annual readers poll bear witness to the rising stature of technology in the midmarket, with top technology decision makers -- particularly those with the C title -- reporting an upswing in money and power. We have organized this special package along four themes: what you make, how long you have held your job, what your career strategies are and what you want to do next. We look at the results by job title, company size and more. So read on, and find out just how well you're doing. The top IT executive at a midsized company might hold one or more of these titles: CIO, vice president of IT, director of IT. Which one(s) often depends on several factors, including company size, the preference of management and how strategic to the business IT really is. But if there was any doubt that the CIO title trumps the others, read on for the results of the 2006 CIO Decisions Midmarket Salary and Careers Survey. Our 457 respondents, all CIO Decisions subscribers, represent more than a dozen industries. Some 70% work at companies with $500 million in annual revenue or less. Their average age is 46. Across all titles, nearly half have 20-plus years in IT. Yet in many ways, the CIOs stand apart. 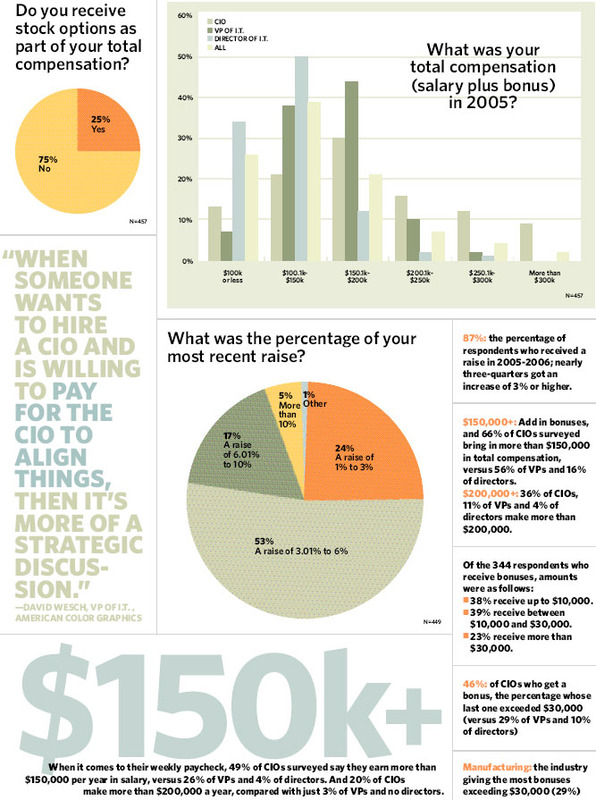 Some 66% of the 128 CIO respondents bring home $150,000 or more in salary and bonus, compared with 56% of the 61 vice presidents of IT and 16% of the 210 directors -- and differences grow only more extreme at higher compensation levels (see "Salaries"). Almost half of CIO respondents say they report directly to the CEO, compared with 26% of VPs of IT and 16% of IT directors. 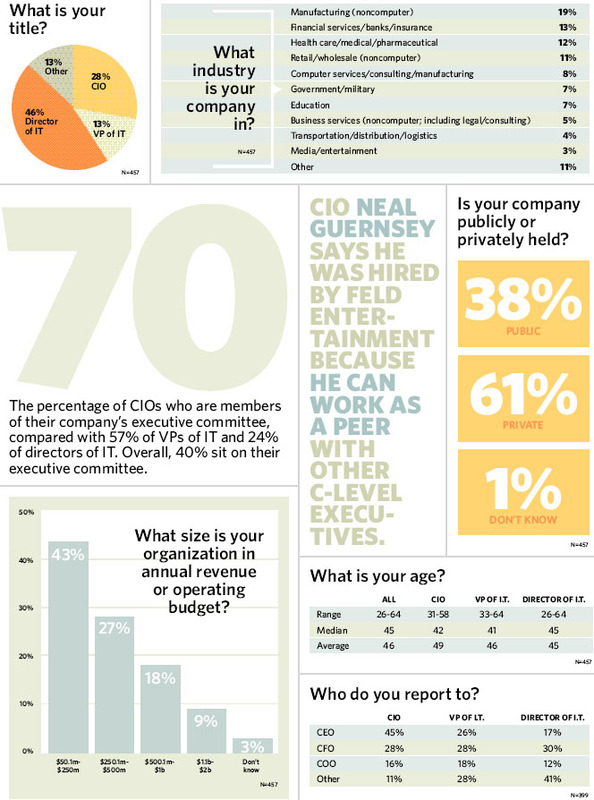 And a whopping 70% of CIOs hold a seat on their organization's executive committee. Just 57% of VPs and 24% of directors do. Even respondents without the C title acknowledge that it makes a difference. "When executive management of a company assigns the CIO title to someone, it shows an awareness [in] the executive suite that IT is a critical component within the associated business," says Bill Wade, VP of technology solutions at $125-million Texas Capital Bank in Dallas. He hopes to gain the CIO title once he completes an IT restructuring at his company. Then "the title should have more meaning to the executive management, and the role will be more defined," he says. Heather Liddell, an analyst at Forrester Research Inc. and the author of a 2005 report on the CIO role, attributes the executive presence of many CIOs to companies' changing view of IT from cost center to innovation enabler. "This shift of priority undoubtedly elevates a CIO's strategic importance in the firm," she says. And the shift is happening faster in the midmarket than in larger firms, says Karen Rubenstrunk, a senior partner in the CIO practice at executive search firm Korn/Ferry International. "I'm finding this trend to be stronger in the medium-sized companies because the CIO has a tendency to be a little more active in the overall business," she says. That's certainly true for Neal Guernsey, vice president and CIO of Feld Entertainment Inc., the parent company of Ringling Bros. and Barnum & Bailey Circus and Disney on Ice. Guernsey says he was hired because he can work as a peer among C-level executives. "I'm bringing something to the table from every job I've had," says Guernsey, who, like 62% of CIOs surveyed, has more than 20 years of IT experience. On the tenure front, executive turnover remains high, with a majority of respondents reporting that they've been in their job for five years or less. But half of CIOs have held their job for more than five years, an improvement over the oft-cited average of 18 months, published in a Meta Group survey in 2000. Overall, the survey shows that many respondents receive the acclaim due an IT leader. But there is room for improvement. You could say the C in CIO stands for cash. The higher the compensation level, the more CIOs (and the fewer VPs and directors of IT) you find there. For example, 66% of CIOs earn more than $150,000 a year in salary and bonuses, compared with 56% of VPs and 16% of directors. At the $200,000 mark, 36% of CIOs are in the game, compared with 11% of VPs and 4% of directors. Company size can make a difference. In our survey, 53% of respondents at companies with more than $1 billion in annual revenue earn more than $150,000 in salary and bonus, compared with 27% of execs at organizations with $50 million to $250 million in revenue. CIOs at bigger companies often run a more complex and larger-staffed IT department, says Karen Rubenstrunk of Korn/Ferry International. Companies have also resumed giving pay raises after the lull in salary increases that followed the dot-com crash in 2000. Some 87% of respondents report receiving a raise in 2005-2006, and about half say it was in the range of 3% to 6%. Nearly a third of CIOs and VPs received raises of 6% or more, compared with a fifth of IT directors. Compensation often includes a bonus, which 75% of our survey respondents say they're eligible to receive. The amount varies greatly, though 62% report that their last bonus was more than $10,000 (see data below). And once again, more CIOs are found at the high end: Of those CIOs who get bonuses, nearly half receive more than $30,000, compared with a third of VPs of IT and 10% of IT directors. CIO John Havener of Hacienda Builders, a home builder in Phoenix, says his annual compensation package includes a $170,000 base salary and a bonus equal to 100% of his salary. In previous jobs, Havener received a bonus of 30% to 40% of his salary, though he acknowledges his current bonus could shrink if the U.S. housing market cools. But Havener is quick to note that money doesn't drive his career choices. "I would leave if I didn't like the company," he says. "If this company shifted to a different management philosophy, I would probably do something else." Compensation is a powerful indicator of how a midmarket company views technology's role. "If a company sees technology as a business enabler that drives efficiencies and drives down costs, as opposed to a change agent and an innovation supporter, the salary is going to be lower," Rubenstrunk says. David Wesch, VP of IT at $450-million American Color Graphics Inc. in Brentwood, Tenn., aspires to be a CIO even though his company has only one C-level executive: the CEO. "I do believe that when someone says they want to hire a CIO and is willing to pay for the CIO to align things, then it's more of a strategic discussion," he says. In 2000 the average CIO tenure was estimated to be a whirlwind 18 months, according to Meta Group. CIOs, it seemed, were being shown the door before they had time to give their elevator pitch. Last year, Forrester Research Inc. released a new CIO tenure estimate of 3.6 years. And Gartner Inc. (which has since acquired Meta Group) was even more optimistic, saying that based on a survey of 1,400 respondents, average CIO stints were stretching longer than four years. For Shamrock Foods Vice President and CIO Rob Baxter, a CIO shelf life of fewer than three years just doesn't add up. Baxter says that the first year should be dedicated to understanding business processes and the big picture. Then year two is about setting strategy, and year three is about execution. "The challenge is crossing the chasm between business and technology," says Baxter, who has been at the $1.6-billion Phoenix-based food distributor for about six months. "CIOs need to stay three years. Anything less, and you haven't accomplished a heck of a lot." At 53, CIO Neal Guernsey arrived at Feld Entertainment a little more than a year ago. "I decided I didn't want to work for another high-tech company," Guernsey says. "I'd rather take everything I had learned and apply it to a midmarket company." Like many CIOs, Guernsey was brought in to create change quickly, and he has replaced nearly half of a 30-member IT staff over the past 12 months. "I can see myself in this job for at least five years," Guernsey says. "My title is VP and CIO. So they are counting on me to provide guidance and to understand their business goals. There is no way that I am going to get everything done in this job that I want to do in 18 months." To reach the IT management peak, you can work your way up at one company or move from a departmental role at a large organization to the top post at a smaller one, among other options. In fact, nearly 60% of survey respondents worked at a larger company before accepting their current position at a midsized one, like United States Tennis Association CIO Larry Bonfante. Bonfante joined the New York-based USTA, which has roughly $225 million in annual revenue, just over four years ago after a decade of working on global infrastructure projects at the pharmaceutical giant Pfizer Inc.
Like other respondents who participated in follow-up interviews for the survey, Bonfante wasn't looking for a new job when a former colleague telephoned him about the CIO job at USTA. But it put him among the 42% of respondents who found their current position through a personal connection, the most frequent response. The next most common: in-house promotions (21%) and recruiters (18%). For Bonfante, the decision to become a midmarket CIO and leave behind the security that sometimes comes with a larger institution was driven by the chance to make work exciting again. "I'm not Donald Trump, but you get to a certain point where you are already paying the bills. You have kids in private schools and a mortgage. And you want to be in a place where you can make a difference -- have an impact," says Bonfante, 46. Stuart Gross, director of IT and security at the privately held Southern California Physicians Managed Care Services in San Diego, moved from Connecticut so he could enjoy year-round golf, not full-time work. "I had no job. I didn't have a line on a job. I met a recruiter socially. She called me a week later and told me she had a desperate client who needed someone for a project right away." Working first as a consultant, Gross was offered a full-time job as a member of the senior management team a few months later and has been the company's senior IT manager for the past four years. Gross is among the 16% of IT directors surveyed who say they report to the CEO. "I told them I didn't care so much about the title," he says, "as long as I reported to the CEO. Otherwise, you are reporting to a user who is competing with other users for IT services." Like the majority of survey participants who have more than 20 years in IT, Gross has a résumé filled with decades of IT experience in manufacturing and consulting. It was the challenge of a new industry that attracted him to the health care job, he says. Today he enjoys strengthening his CV with IT security classes, seminars and networking on crucial issues such as health care compliance and regulations. Mostly, he enjoys being part of a senior management team that considers IT a crucial part of its overall business strategy, he says. "At 60 years old," Gross says, "I wouldn't be working someplace I didn't like." Mike Easley is the CIO of Home Quality Management, a private long-term care company in Palm Beach Gardens, Fla., with estimated revenue of $184 million. He's one part technologist, one part accountant -- and all business. "It's why I love my job," Easley says. "I am expected to know every facet of the business and understand operations." Asked which skill CIOs of the future need most, Easley is quick to answer: "Accounting. You already see more CIOs with MBAs. I think you'll see a stronger accounting track in our field." Easley says he's among the CIOs whose careers are changing as the industry undergoes a shift. "The role is transforming every year, and I find my peers are transforming. You're going to see the CIO becoming more of a global business driver and less of an information officer." 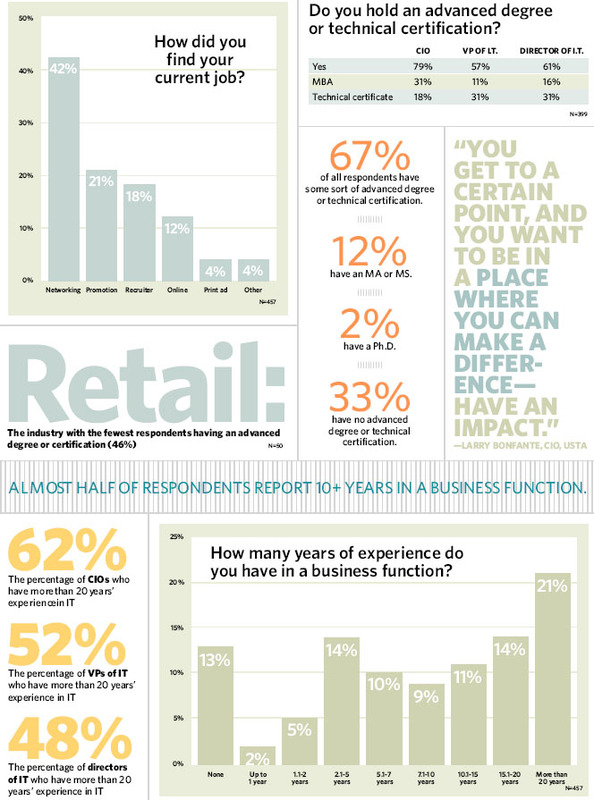 Survey results show IT executives primed for that challenge. Two-thirds want to stay in their current role or move up in IT or within their organization. Short-term aspirations differ slightly among those at the lower and higher ends of the midmarket: Respondents at companies with revenue of $50 million to $500 million most frequently say they want to continue in their current role (about one-third). Among respondents from organizations with $500 million to $2 billion in revenue, the most popular answer was to move up within their company. Overall, the top priority among 18% is to move to a larger company. Yet when asked open-ended questions about their ideal next role, respondents' answers spanned broader ground. Roughly 40% want to be CIOs, and many specified doing so in a larger organization, at a different organization, or at one that's technologically backward and needs a digital knight to ride in on a pixilated horse. There are those who aspire to become CEO (10%) or attain another business title: COO, VP, GM, head of sales. Some dream of alternate careers as a pilot, a professor, or an operator of a bed and breakfast hosting corporate retreats in Maine. And besides those who say they already have their dream job are those quietly asking for the respect they deserve. "A boss who knows business and IT well and is willing to accept opinions from others," writes one respondent. "A company that values IT's role in making business profitable," says another. "CIO for my current company," says one IT director who notes, "I already hold the highest IT position but would like the recognition." METHODOLOGY: CIO Decisions conducted the first annual CIO Decisions Midmarket Salary Careers and Survey among qualified subscribers in February and March 2006. The 457 respondents completed an electronic questionnaire consisting of 30 multiple-choice and short-answer questions. Among respondents, 28% were CIOs, 13% were vice presidents of IT, 46% were IT directors, and 13% had other titles. Respondents with multiple titles that include a CIO title (such as CIO and vice president or senior vice president) were grouped into the CIO category. All responses tabulated came from individuals at organizations with $50 million to $2 billion in annual revenue or operating budget. The margin of error for data with 457 responses is + or - 4.5%, with a 95% confidence level. Some figures may not total 100% due to rounding. CREDITS: This section was reported and written by Tom Kaneshige, Stefanie McCann and Ellen O'Brien. Data analysis by Anne McCrory. To comment on this story, write to editor@ciodecisions.com.